Despite the title of the work, Christianity and Islam under the Sultans, Hasluck did not set out to create a comprehensive account of either Christian or Islamic sites in the northeastern Mediterranean. (1) Rather, and more unexpectedly, his monumental work focuses on the sites of symbolic exchange and interaction between the two religious traditions. The books provide an essential view into several liminal and ambiguous sites of the Ottoman Near East and Europe, and the work has become synonymous with studies of hybrid Islamic-Christian sites and traditions in the period. Nevertheless, Hasluck’s work was a product of his time. The digitization of the text enables the investigation and clarification of the terminology employed in the work and helps readers gain new insights into the perception and representation of the identities it contains. The following visualizations provide a few examples of the types of observations made possible through text digitization and analysis. First the word frequency of community names and identity markers shows the weight of attention different groups receive in the text. The distribution of the frequency by chapter is then expressed visually with some interesting results. Subsequently, a related correlation is illustrated among the words linked to the group called “Kizilbash.” Finally, the relationship between the Bektashi and the Kizilbash in the text is modeled and discussed. In every section, you can explore the visualizations yourself by clicking on the charts. You can explore a full ‘story-board’ of community or identity terms here. A variety of proper names appear in Christianity and Islam that correspond to various communitiesEthnic groups or faith-based communities performing religious, spiritual or secular practices in, around or in proximity to a site or place. and community-types in the Late Ottoman period, including names for ethnic communitiesEthnic groups or faith-based communities performing religious, spiritual or secular practices in, around or in proximity to a site or place. (ethnonyms), faith or religious groups, linguistic groups, and “tribal” or kin groups. While there is considerable diversity in the overall range of names appearing in the text, Hasluck was more interested in some than others. At least 100 different identifying labels appear in the text, but only 16 of them appear more than 100 times. Table 1 presents these; click the chart to view the complete list. The author’s overwhelming interest in the appearance of Christian forms at Islamic sites, especially among the Bektashi is obvious, but his other key points of reference represent an interest in the peripheral influences on Anatolia in the period. Word groups include variations of key terms (e.g. 'bektashis' is included in the 'bektashi' word group). Scholars have already recognized these predilections,(2) but it is interesting to observe the distribution of particular terms throughout the text. Chart 1 visually graphs the appearances over the span of the work: the thicker the line indicates a greater volume of appearances in a single chapter. Line thickness shows frequency. Scroll horizontally to browse through chapters. The chart shows that community terms appear in different patterns. The terms for broad, regional identities such as “turkish” and “greek,” as well as the religious terms “christian,” “moslem,” and “islam,” are relatively evenly distributed throughout the text. They experience few sustained breaks in usage, while other, more specific terms such as “dervish,” “arab,” “kizilbash,” and “mevlevi” appear to be constrained to limited sections corresponding to areas of the text focusing on that particular subject. These contrasting patterns suggest a general framework in which Hasluck identified groups: through primary reference to larger national and religious identifications rather than a complex genealogy of interconnected or intersectional heritages. 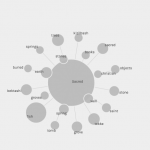 As a final example, we zoom into the cluster of words corresponding to the Kizilbash specifically in order to see what semantic fields are related to the term in the text. The constellation of related, heterodox, minority groups that includes the Alevi, Bektashi, and Qizilbash (“Kizilbash”) is well known, and Hasluck was the first to “ethnographically” and sociologically investigate the relationship between these groups. (4) But while the connection between them is certain, the markers distinguishing them from one another are much more challenging to ascertain. The digitization of the text makes it possible to tease out another way of comparing the groups by examining the language Hasluck employs when discussing them. The term Alevi barely appears in the text, but the name is significant because it seems to have replaced the name “Kizilbash” in relatively recent history (Mélikoff 2004: 301; 1975). The Alevi-Kizilbash were a Bektashi brotherhood (tariqa) that until recently occupied rural regions of Anatolia, but also had their own, independent, identity that Hasluck attempted to summarize (Hasluck 1929: 139–58). The following chart is a collocation Collocation is defined as "the act or result of placing or arranging together; specifically : a noticeable arrangement or conjoining of linguistic elements (as words)". graph for the key terms “bektashi” and “kizilbash.” The orange nodes represent neighbor terms that appear at least five times in the text close to the key term. Relation of key terms ('Bektashi', 'Kizilbash') to 'neighbors', most frequently appearing in proximity. Node size shows frequency. Uze controls to zoom in / zoom out and increase / decrease the number of nodes shown in the network. Unsurprisingly, the cloud of terms surrounding the Bektashi is much larger than the one around the Kizilbash, but the set of terms with connections to both key terms are words appearing next both both terms somewhere in the text. Some examples of terms they have in common include, “sacredTerm associated with religious and spiritual practices performed by one or different groups in a site or place.,” “yuruks,” “vilayet,” and “pilgrimage,” but perhaps the most interesting feature is the set of terms that they do not share. The cluster appearing on the far right are terms touching only “Kizilbash” and not “Bektashi,” including “kaza,” “marriage,” “dersim,” “village,” “anatolian,” “takhtaji,” “kurds,” and “turks,” among others. (5) Reference to marriage and the Takhtaji appear because of the groups’ distinctive, heterodox marriage practicesSecular or religious uses of a site or place (e.g. ritual, pilgrimage), while the ethnic terms appear in sentences attempting to describe the Kizilbash’s broader connections. Overall, this cluster points to a distinctively provincial character for the Kizilbash, reinforcing their links to the rural countryside rather than to specifically theological or rites-based markers of identity. (1). The book’s title is actually an homage to Hasluck’s earlier 1913 article, which was updated and re-printed as Ch. 26 of the book. (2). See Shankland (2004a) (three volumes) for discussion and analysis. (3). See Karakaya-Stump (2004) for discussion of his sources and contribution on this subject. (4). See Shankland (2004b: 30–2) for a general summary. For detailed treatments see Volume I, Part III: “Ethnography and the Alevi-Bektashis” (pp. 297–401) and Volume III, Part II: “Heterodox Currents” (pp. 89–202). (5). Increase the number of nodes to see the complete list. Hasluck, Frederic W. 1913. “Christianity and Islam under the Sultans of Konia.” The Annual of the British School at Athens 19: 191–97. Hasluck, F.W. 1929. Christianity and Islam under the Sultans. Edited by Margaret Masson Hardie Hasluck. 2 vols. Oxford: At the Clarendon Press. Karakaya-Stump, Ayfer. 2004. “The Emergence of the Kizilbas in Western Thought: Missionary Accounts and Their Aftermath.” In The Life and Times of FW Hasluck, 1878–1920, edited by David Shankland, 1:329–53. Istanbul, Turkey: The Isis Press. Mélikoff, Irène. 1975. “Le probleme kizilbas.” Turcica 6: 49–67. ———. 2004. “Hasluck’s Study of the Bektashis and Its Contemporary Significance.” In The Life and Times of FW Hasluck, 1878–1920, edited by David Shankland, 1:297–307. Istanbul, Turkey: The Isis Press. Shankland, David, ed. 2004a. The Life and Times of FW Hasluck, 1878–1920. 3 vols. Istanbul, Turkey: The Isis Press. ———. 2004b. “The Life and Times of F. W. Hasluck (1878-1920).” In The Life and Times of FW Hasluck, 1878–1920, edited by David Shankland, 1:15–67. Istanbul, Turkey: The Isis Press.